Our Tumbling classes are for school aged children. This class will emphasize proper (Safe!) progression in tumbling skills. We teach beginning to elite skills. Prerequisites (5/5/5): 5 second handstand against the wall, 5 push-ups, 5+ sit ups. Children not yet at this fitness level should register for Gym Stars or Cheer until the levels can be met. Tumbling differs from Gymnastics in that it focuses on the floor skills only. We know that you want your child to be taught the safest way possible and with the ability to progress in the long term. At Leaps & Bounds we teach in a progressive manner, breaking down complex skills into mini skills. After the student learns the mini skills, the more complex skills are easier to achieve, safer, and will lead into other skills without numerous corrections. We are known for tumblers with good technique. Our coed classes are great for divers, cheerleaders, gymnasts, aspiring competitors and anybody who wants to learn how to defy gravity. We use school grade as the primary variable to determining your child’s class time. We then subdivide each class into logical similar training groups. Advanced tumbling classes require an instructor evaluation before enrolling. Our Tumbling curriculum is based on the USAG Jr. Olympic Program as well as our 17 years of experience teaching tumbling to children. The Tumbling curriculum is designed to provide a non-competitive, flexible program of life skills, conditioning and flexibility. Evaluation & Documentation: Kids are tested on the last class of every other month and will receive a progress report shortly after testing. Classes progress from beginner to intermediate to advanced. 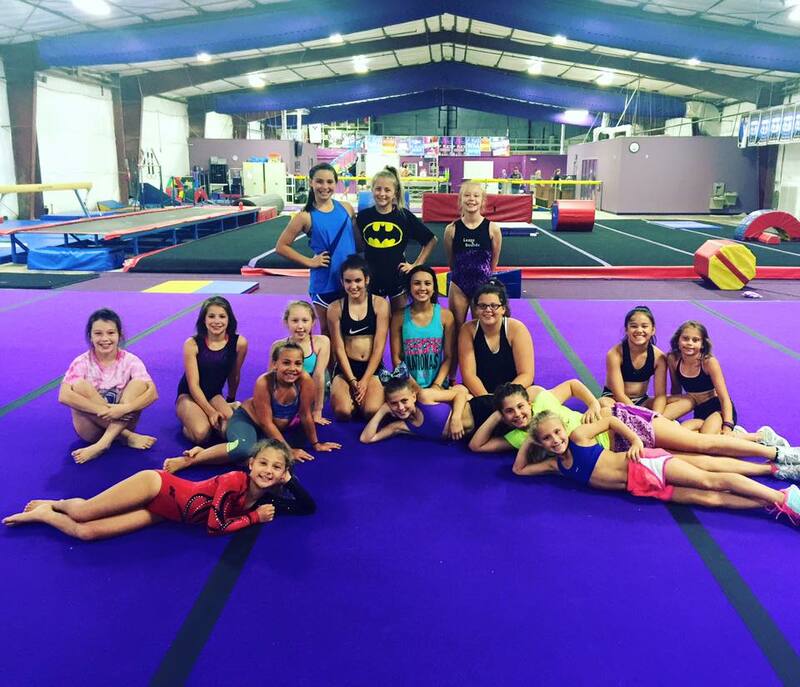 Tumbling Classes: This class is for every kid who wants to defy gravity! The focus of this class is a well rounded development of tumbling skills that travel forward and backwards. See skill levels on the next page. Great for cheerleaders, divers, gymnasts, and aspiring competitors. Tumbling Meets & Leaps Live…Every Child is a Winner! We offer tumbling meets & Leaps Live which are exciting events for the entire family! Mom, dad, brother, sister, grandma and grampa are all invited to watch your star Tumbler participate in a real gymnastics meet designed expressly for fun and personal achievement. Leaps Live is an amazing production with the entire gym participating in the performance. How Many Classes Per Week? On this subject, we have a little different view than many organizations. For younger or beginning tumblers we recommend one class per week. The decision to come two or more times a week is very personal and we recommend considering more than once per week only after your child has expressed their desire for faster progress. Your Program Director will be glad to discuss the merits of such a decision should that time come. Make Ups: Although it is always best to attend your regularly scheduled class, we allow two make-ups per term. Please call the office to schedule a make-up, as we do limit the number of make-ups in any class. What To Wear To Class: Girls should wear a leotard or shorts & a T-shirt, tucked in. Boys wear shorts and a T-shirt, tucked in. Outfits are available in our A Lil Happy Gift Shop. Tumblers may tumble barefoot or with cheerleading shoes. No gum or jewelry. Hair must be pulled back for safety, as long hair interferes with rolling, somersaulting and twisting skills. Which Class? All kids will start in a beginner class to be evaluated by the teacher and will be moved into a higher level class if needed.